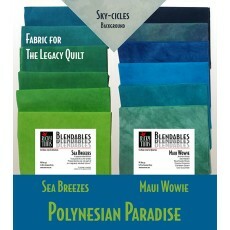 Polynesian Paradise is a cool and refreshing colorway assembled for The Legacy Quilt. The Polynesian Paradise colorway comes with four yards total fabric - twelve fat quarters and a yard of background fabric. This enough to make several blocks of your Legacy Quilt. When you are running low on fabric, come here to order more. Sea Breezes has six fat quarters: These colors are not available by the yard. Maui Wowie has six fat quarters: Anchors Away, Sea Maiden, Blue Suede Shoes, Coconut Snowcone, Caribbean Queen, and Cool Cucumber . These colors are not available by the yard. Sky-cicles - one yard piece to be used as the background fabric. Join the Legacy Quilt Club by just participating. Get the details on the Legacy Quilt and download your Free Blocks Here.